Traditionally, every week we bring you a list of the top former Oilers players who continue their career in pro basketball. #1. Josh Bostic (6'5''-G/F-87, graduated '09, plays pro in Poland) was the major contributor in an Asseco Arka Gdynia's victory against the 12th-ranked HydroTruck Radom (5-12) crushing them 100-73 in the Polish EBL on Sunday night. He scored 16 points and grabbed 4 rebounds in 20 minutes. Asseco Arka Gdynia (14-3) is placed third in the EBL. It was his team's third consecutive victory in a row. It's Bostic's first season with the team. Bostic has individually a very good year with high stats. He averages 16.8ppg, 3.8rpg, 2.9apg and 1.6spg. #2. Lee Roberts (6'7''-F/C-87, graduated '09, plays in Argentina) could not help San Martin Corrientes (8-5) in their last game. Despite his very good performance San Martin Corrientes lost 63-72 on the road to the much lower-ranked (#12) Olimpico de La Banda. Roberts was the top scorer with 15 points. He also added 4 rebounds (was perfect 7-for-7 from the free throw line). But this is still an early stage of the season and everything may happen. It's Roberts' first year with the team. Roberts has relatively good stats this season 14.1ppg, 8.2rpg, 1.6apg and 1.1spg in 13 games he played so far. #3. 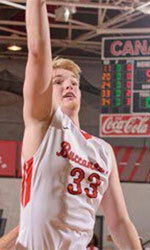 Rob Marsden (6'7''-F-88, graduated '12, currently in United Kingdom), who plays in the British BBL was not able to help DBL Sharks Sheffield (6-3) in their game last Friday. Despite Marsden's good performance DBL Sharks Sheffield was badly defeated 83-66 in Plymouth by the lower-ranked Raiders (#6). He recorded a double-double by scoring 10 points and getting 11 rebounds in 31 minutes. Marsden has relatively good stats this season 11.2ppg, 7.0rpg and 1.4apg. #4. Taren Sullivan (6'6''-F-95, graduated '18, plays pro in the NBA G League) contributed to a 1-point Stockton Kings' victory against the Santa Cruz Warriors (24-8) 105-104 in the NBA G League on Friday night. He scored 10 points, had 4 rebounds and dished 4 assists. It was the game of the round between two top 2 ranked teams in group W Pacific. The Stockton Kings have a solid 19-12 record this season. It was his team's third consecutive victory in a row. It's Sullivan's first year with the team. This season Sullivan averages 4.9ppg, 2.5rpg and 1.1apg in 28 games. #5. Martyce Kimbrough (6'1''-G-96, graduated '18, plays in Spain) was not able to secure a victory for Gijon (6-13) in their game last Sunday. Despite his good performance the 11th-placed Gijon (6-13) was defeated 88-84 in Logrono by the higher-ranked Cocinas.com (#7) in the West group. 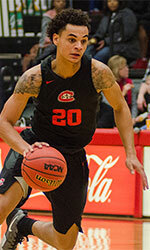 Kimbrough recorded 10 points and had 3 steals in 26 minutes. There are only three games left until the end of the Regular Season. So now every game will be critical. It's Kimbrough's first season with the team. He has relatively good stats this year 11.9ppg, 3.1rpg, 1.7apg and 1.1spg.